On December 31, 2013-New Year Eve, Dana Dourdeville, a 21-year-old student at Brown University, was missing, Fairhaven when he kayaked to hunt ducks around the West Island, Fairhaven. The Coastal Guard began a search around 7 PM, found his kayak east of West Island around 11 PM, but could not find Dana for a week. 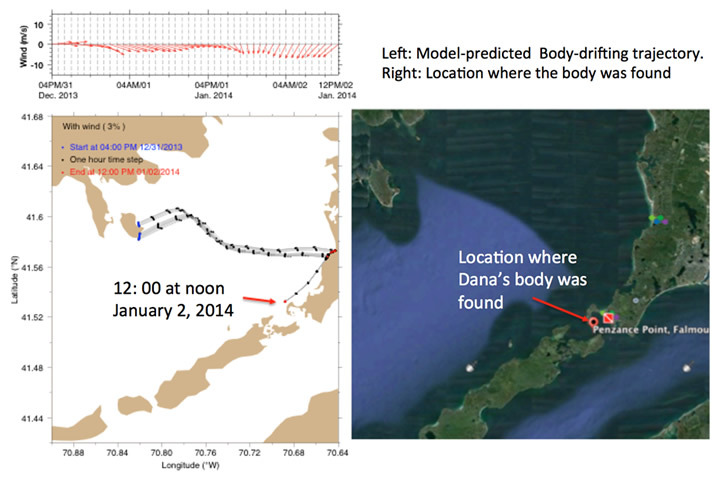 A volunteer Dr. Don Anderson contacted Dr. Chen on January 5, 2014 to see if NECOFS could help locate Dana. We have used the NECOFS-predicted wind and flow fields to conduct a body-tracking experiment, and found that with 3% of wind factor, the model-predicted body-floating trajectory matched well with a kayak’s location when it was found. Based on this trajectory, we predicted that Dana’s body was drifted to the Falmouth coast within 24 hours and then moved south next day. Dr. Anderson provided modeling-tracking results to the search team, and they found Dana’s gloves on the Falmouth beach on Thursday and then his body in Penzance Point, Falmouth on Friday: two areas were close to the NECOFS-predicted locations. This experiment provides an example how NECOFS could be used for the ocean rescue. The model-tracking experiment was made by C. Chen and Q. Xu at SMAST/UMASSD. The start time and location of body’s tracking were suggested by Dr. D. Anderson.